As with many other areas of contemporary life, the ways in which readers access the written word are changing all the time. The theme of today’s post – literary crowdfunding – is one which I find very interesting and exciting. Independent publishers Unbound recently came to public attention when one of their crowdfunded titles, The Wake, by Paul Kingsnorth, made the longlist for this year’s Man Booker Prize. There’s a lot of bold, innovative and high quality writing out there that deserves to find an audience regardless of whether it ticks the usual boxes and this week’s title is a prime example. Crowdfunding. Sounds great, doesn’t it? Modern, fun, communal, democratic. Uuum. Yes. It is all of those things but it is also hard work. For the last six weeks I have spent all day, every day, trying to get people to subscribe to my book. Sometimes I feel full of enthusiasm, sometimes I have to read myself the Riot Act or I would give up. This morning was an up moment. I got a message in my Writers’ Shed from a woman I’ve never met who tells me that she is supporting the book because her daughter is battling with infertility and wishes people would talk more openly about such problems. Wonderful. That’s the magic of Unbound and their crowdfunding model. Through the device of the Writers’ Shed it puts writers and readers directly in touch. And so far readers – both known and unknown – have been amazingly supportive. They have helped me to raise over £7,000 which is 61% of what I need. But there are downsides as well. There are close friends and family who haven’t signed up. I know I mustn’t take this personally, they are busy. But still the reality is that, although Unbound brings new friendships, it can also cause bust ups in old ones. You know exactly who has signed up, who hasn’t, and who is claiming they have when they haven’t. But overall I love what Unbound are doing. For too long everyone has complained about the publishing industry and done nothing to change it. In the past, I was published by Simon and Schuster and that was certainly easier. But it also made me feel passive, powerless. Unbound are out on the barricades and I feel that I’m out there with them. It is unnerving but exciting. For me, the whole process would, of course, be easier if I were raising money for a comic novel. But my memoir was a tough book to write and it is also hard to sell. It attempts to break down two of the last taboos surrounding motherhood – stillbirths and surrogacy. Sometimes I feel like I’m sitting in a trench with a tin hat on. Why – some people ask – would you want to write about something as grim as stillbirths? But far more often women tell the story of their sister, their aunt, their best friend, their colleague. A taboo is something that no-one wants to talk about, it is also something everyone wants to talk about. Then there’s the surrogacy question. Plenty of people have an axe to grind on that one. It takes a bit of nerve to admit that you paid another woman to have a baby for you. The danger that I will be depicted as a spoilt, rich woman who bought herself a baby is very real. But again that’s partly why I wrote the book – because there is just too much misinformation and confusion in discussions of surrogacy. I wanted to tell the story of a ‘normal’ surrogacy that ended well for everyone involved. My book certainly doesn’t ‘market’ surrogacy but it does give an honest account of the details of how surrogacy works. No other book has done that. But finally it is the reader who decides on the moral questions it raises. 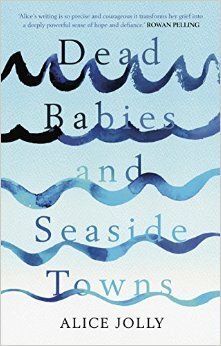 None of these difficulties are improved by the fact that I have given the book a tricky title – Dead Babies And Seaside Towns. Although my agent and Unbound support the title, other people have suggested that it’s a killer. I remain uncertain. I absolutely don’t want to offend people who have lost babies. But then it’s exactly that word ‘lost’ which is the problem. When a stillbirth happens the baby is not lost or sleeping, it is dead. But bereaved parents have to use euphemistic language so as not to cause offence. One of the questions behind the book is – why can’t we just talk about situations of extreme adversity openly? I’m a great believer in the saying, ‘Not every problem that is faced can be solved but if a problem isn’t faced it will never be solved.’ That summarises neatly why this country has a shockingly high rate of stillbirths. In a recent study of similar income countries, the UK rated 34 out of 35. And finally it’s that statistic which ensures – no matter how tough it gets – I am absolutely determined that my book will be published. 50% of the proceeds of my book are going to Sands (The Stillbirth and Neo-natal Death Charity). If that helps to bring about some change – no matter how small – then I’m happy to sit in a trench with a tin hat on for as long as it takes. I’m going to be totally frank. If I’d let Alice’s brave but harrowing choice of title put me off I would have missed out on one of the most searingly honest and compelling pieces of writing to come my way. Of course this is a very painful read in some respects (including some I didn’t anticipate) but it is also beautifully written, deeply moving and full of emotional intelligence and wisdom which resonate far beyond these pages. A welcome vein of dark humour runs through it – overall, it is surprisingly uplifting. Alice subjects her extraordinary experiences of actual and attempted motherhood (she and her husband had a son before the events of the memoir), her decisions and motives to the most intense and unflinching scrutiny – there can be no easy answers to these questions. She is commendably open about the fact that her privileged circumstances gave her options most women would not have and this definitely helped to keep me on board even when I couldn’t always relate to what was going on. I’ll never forget this book because I’ve never read anything like it. It’s inevitable and understandable that many people will not want to read it – what’s important is that we have the option. It depresses me that whilst very serious issues such as child abuse and violence against women have become commonplace in fiction and drama, there are still some aspects of real women’s lives that are regarded as unspeakable. Alice is willing to risk controversy to break that silence and I have a feeling that despite everything, this book will reach the wide readership it deserves. Next week, Charles Lambert joins me on the Literary Sofa to discuss his beautiful novel-in-fragments, With a Zero at its Heart. I didn’t know about Unbound and am going straight to their website NOW. I totally agree that the subject is taboo and people use euphemistic language even when sharing their experience with close friends. I think Alice Jolly is brave to tackle it, and thank you Isabel for inviting her to your sofa. And… I like the title! I love Alice Jolly’s writing and I’m one of those Unbound subscribers cheering her memoir on from the sidelines. I think it’s a great title. And that’s a great review!